Thai Airways domestic LCC subsidiary Nok Air is preparing to expand into the regional international market as it rapidly grows its new Boeing 737-800 fleet. The new Nok international operation will launch in early 2013 and fill a critical void in the current Thai Airways Group portfolio, which currently lacks a product for the fast-growing budget end of Thailand’s international market. Thai Airways originally planned to launch a new ultra low-cost carrier for the regional international market, potentially in partnership with Nok, but the group’s board recently decided against proceeding with this project and establishing a fourth brand. The Thai Airways Group will now stick with its three existing brands – Thai, Thai Smile and Nok. Thai Smile and Nok are both considered hybrid carriers but Nok’s cost structure is significantly lower than Thai Smile and should be sufficient as the group aims to compete more effectively against Thai AirAsia and other LCCs. Nok CEO Patee Sarasin tells CAPA that Nok has drafted a business plan that envisions launching an international operation in 1Q2013. The plan will be presented to Nok's board on 26-Jul-2012. Mr Patee says Nok plans to use 737-800s in two-class configuration for the new international operation, which will most likely start with flights from Bangkok’s Don Mueang Airport to China. Several routes within three to four hour range of Bangkok are planned for the first year, including several destinations in China. Nok’s decision to launch international services follows a study that was conducted over the last few months that examined the feasibility of expanding into the international market and potential routes. At the same time Nok and Thai Airways conducted a separate study that looked at a potential joint venture ultra low-cost carrier for the regional international market. Mr Patee says while Nok has decided to proceed with the Nok-branded project the Thai Airways board decided very recently to not proceed with the proposed ultra low-cost carrier. Thai Airways originally unveiled plans in 2010 to launch a joint venture ultra low-cost carrier for the regional international market with Singapore-based Tiger Airways. But plans to launch Thai Tiger were dropped in 2011 after repeated delays in securing approvals to establish the new company. After the Thai Tiger project fell through Thai Airways did not adjust its medium-term strategy, which continued to envision a four-brand matrix with a new ultra low-cost carrier for the regional international market. Thai Airways executives as recently as Mar-2012 told CAPA that the group believed it still needed a new brand with a lower cost structure than Thai Smile and Nok. At the time it was open to exploring joint ventures with other foreign LCC groups to fill this void in its brand matrix. In recent months, Thai Airways also started to look at establishing a joint venture ultra LCC with its partially owned subsidiary Nok. 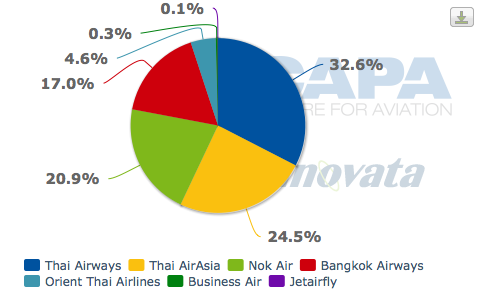 Thai Airways currently owns 49% of Nok, having increased its stake in Oct-2011 from an original 39%. Mr Patee says Thai’s board has now decided to take the planned fourth ultra low-cost brand “out of the matrix”. Thai Airways, which is currently looking for a new CEO following the departure of Piyasvasti Amranand in Jun-2012, “is trying to focus more on their own products,” Mr Patee explains. That leaves Nok on its own to fill the Thai Airways Group gap in the budget end of the regional international market. While Nok is proceeding with the new international operation independently, Thai Airways will still have some say in how the new operation unfolds as Thai Airways has five of the nine seats on Nok’s board. All of Nok’s new international routes will require approval from Thai Airways as the group works to improve its overall network. Mr Patee says Nok’s new international network is being designed to not cannibalise Thai’s existing mainline operation. He says Nok will open up new destinations for the Thai Airways Group, particularly in mainland China, although there will also be some destinations which the two carriers operate side by side. Nok will also not overlap with Thai Smile, a new unit of Thai Airways that launched services on 07-Jul-2012 following a hybrid model with some LCC elements and some full-service regional carrier elements. Thai Smile currently serves Macau and will launch domestic services over the next few months to Chiang Mai, Krabi, Phuket and Surat Thani. Nok also serves Chiang Mai, Phuket and Surat Thani (it does not serve Krabi). Thai Smile, however, operates from Bangkok’s main international airport Suvarnabhumi while Nok operates entirely from Bangkok’s old airport Don Mueang. Thai Smile plans to stay at Suvarnabhumi as Don Muang is opened to international LCC services. Don Mueang currently only handles domestic flights but the Thai Government recently approved a plan to open Don Mueang to international point-to-point services from LCCs effective 01-Oct-2012 as part of a plan to ease congestion at Suvarnabhumi. Thai AirAsia has decided to move its entire domestic and international operation to Don Mueang in 4Q2012. Some foreign LCCs are also likely to move, attracted by lower landing fees and incentives from Airports of Thailand including reimbursement for moving costs. Thai Smile however will stay at Suvarnabhumi because of its role as a regional feeder to Thai Airways. Thai Smile even uses Thai Airways’ TG code and Thai Airways’ air operator’s certificate. Nok caters to a vastly different market segment than Thai Smile and Thai Airways. But it is also not a pure LCC. Nok has a business class product on its Boeing 737-400 fleet, which it has offered since launching services in 2004. The carrier also provides free checked bags, water and small snacks. Other beverages are sold across both cabins. No hot meals are available as Nok's aircraft are not currently equipped with ovens. Mr Patee says Nok plans to continue with the same product offering across its new international network. Nok is now in the process of transitioning its fleet of 737-400s, which are configured with 138 economy and 12 first class seats, to 189-seat 737-800s in single class configuration. But while Nok is phasing out the first class product domestically, Mr Patee says its Nok Plus product will be reintroduced on international services as some of Nok’s future 737-800s will be configured with two classes. Mr Patee doesn’t see a need for first class domestically and says the product was initially only be offered because the 737-400s Nok leased from Thai Airways were already in two-class configuration. While the domestic first class product has developed a following it hasn’t been successful enough to retain as Nok brings in new-generation 737s because the load factor in the Nok Plus cabin has only averaged 50% to 60% (compared to over 80% in economy). Nok Plus fares on average are only THB500 to THB600 (USD16 to USD19) more than economy fares. Mr Patee is confident there is enough demand on regional international routes to offer Nok Plus while achieving higher yields and load factors. While the four 737-800s Nok is already committed to adding in 2H2012 will also be delivered in single-class configuration, he says Nok is now seeking to lease additional 737-800s in 2013 that will be configured with two classes. Nok currently operates four 737-800s, four 737-400s and two ATR 72s. Mr Patee says the carrier has already committed to leasing four additional 737-800s and two ATR 72s in 2H2012, giving it a fleet of eight 737-800s and four ATR 72s at the end of this year. Its first batch of 737-800s were delivered in 4Q2011, allowing the carrier to begin phasing out its ageing 737-400 fleet. Mr Patee says Nok’s four remaining 737-400s, three of which are owned by Thai Airways, will be returned by the end of this year. Mr Patee aims to grow Nok’s 737-800 fleet by two aircraft per quarter in 2013, giving the carrier a fleet of 18 737-800s and six ATR 72s by the end of 2013. He expects the international operation to initially require six aircraft while Nok’s domestic operation will be expanded to 18 aircraft. Nok now serves 27 domestic destinations and plans to add two more – Ranong and Chumphon – by the end of this year. This includes several destinations operated by regional partner SGA Airlines, which operates three Saab 340 turboprops under the Nok Mini brand. Nok also serves some thinner destinations with ATR 72s, which are also owned by Thai Airways. Mr Patee says Nok recently agreed to lease two additional ex-Kingfisher ATR 72s which will be delivered by Oct-2012 and is now seeking to lease two more ATR 72s, which will likely be delivered in 2013. Nok has focused entirely on the domestic market since 2008, when it dropped services to Hanoi in Vietnam and Bangalore in India. But Nok dipped its toes in the international market again in Mar-2012, when it launched international charter flights to China. It now serves Nanjing with three weekly charter flights, which are operated in middle of the night hours. Mr Patee says Nok aims to convert its Nanjing service to scheduled flights as well as add several other Chinese destinations. 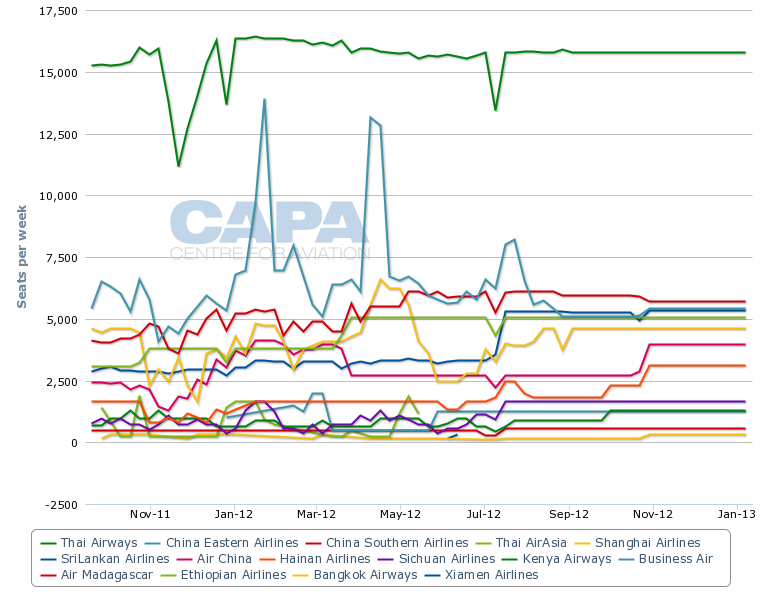 China-Thailand is a booming market served by Thai Airways, Thai AirAsia, Bangkok Airways as well as Chinese carriers (see background information). Orient Thai Airways, which offers scheduled services domestically and to Hong Kong, also has an extensive charter network in mainland China. While Thai AirAsia is also now looking to expand its mainland China network beyond the current four destinations, Mr Patee is not concerned of potential over-capacity as the China market is huge and there are so many potential destinations. Nok is also looking at several potential destinations in Southeast Asia, where Thai AirAsia has an extensive network. Nok's initial international network will be firmed up over the next few months. The new international flights will help further improve the utilisation of Nok’s new 737-800 fleet as some of the flights can be operated during overnight hours. Mr Patee says Nok’s 737-800s are now utilised 11 hours per day, up from an average 7 hours per day in the smaller 737-400s. While Nok has been consistently profitable since launching services in 2004 it has always been relatively conservative, choosing to stick to the domestic market after its brief foray in the Hanoi and Bangalore markets. Nok until recently was content on staying entirely focused on the domestic market, where it has a strong brand and carved out a niche by operating for most of its history at Don Mueang Airport rather than Suvaranabhumi. Nok currently accounts for about 21% of Thailand’s domestic capacity, making it the third largest carrier after Thai Airways and Thai AirAsia, according to Innovata data. AirAsia accounts for about 25% of domestic capacity in Thailand, compared to 33% for Thai Airways and 44% for Thai-Nok combined, but is the leading carrier in Thailand’s regional international market. On routes from Thailand to other countries in Southeast Asia, the AirAsia Group (includes Thai AirAsia, AirAsia Malaysia and AirAsia Indonesia) currently provides about 84,000 one-way weekly seats compared to about 81,000 seats for Thai Airways, according to Innovata data. Nok's expansion into the regional international market will help Thai Airways Group potentially win back its former number one position in the fast-growing regional international market. Nok however will lose a competitive advantage in the domestic market as Thai AirAsia moves to Don Mueang. Mr Patee has maintained over the years that Nok has enjoyed higher domestic yields than Thai AirAsia as its passengers appreciate the convenience of Don Mueang, which is located closer to central Bangkok and was the city's main airport before Suvarnabhumi Airport opened in 2005. Mr Patee is hopeful that Nok can maintain at least some of this advantage but the two carriers will inevitably become bigger competitors as Thai AirAsia moves to Don Mueang and as Nok launches international services. Thai AirAsia and Nok will compete on all major domestic trunk routes from Don Mueang (Nok operates to several smaller domestic destinations that are not served by Thai AirAsia) and the two will also inevitably start to compete on several international routes. While Nok and Thai AirAsia will be fierce competitors at Don Mueang, Suvarnabhumi will become the airport for full-service and connecting passengers. In addition to Thai Airways and Thai Smile, Bangkok Airways will remain at Suvarnabhumi. Bangkok Airways operates both domestic and regional international services following a full-service boutique carrier model that relies heavily on transit passengers coming off long-haul flights operated by foreign carriers serving Bangkok. The international expansion for Nok will usher in a new era for the carrier after several years of modest growth. Nok needs the international market to expand beyond its current small size as its domestic footprint is approaching saturation with virtually all potential destinations in Thailand already served. With its domestic only-operation, Nok expects to carry about 5 million passengers in 2012 (compared to about 4.2 million in 2011) and generate almost THB9 billion (USD285 million) in revenues, compared to THB5.8 billion USD183 million in 2011). With a THB230 million (USD7 million) profit in 1H2012, Mr Patee also is confident that Nok is on target to turn a profit of TBH400 million (USD13 million) to THB500 million (USD16 million) in 2012 - up from a THB250 million (USD 8 million) profit in 2011. (The profit last year would have been closer to THB500 million (USD16 million) if it was not for floods in 4Q2011 that forced the carrier to temporarily move its operation to Suvarnabhumi.) The new international operation will unlock more revenue and traffic growth for Nok and, if the product is positioned properly, higher profits. But just as importantly the Nok international operation will allow Thai Airways to finally compete against Thai AirAsia and other Asian LCCs across all market segments. The new Thai Smile unit provides an important new regional product as Thai Airways transitions to an all-widebody fleet but has limited growth potential as it has a relatively high cost structure compared to LCCs. Expanding Nok into the regional international market may not be the most ideal solution for Thai Airways Group as Nok does not follow a pure LCC model and has a brand that is not widely recognised outside Thailand. But Nok has proven in its first decade to be a successful hybrid LCC with a competitive cost structure that - unlike Thai Smile - does not suffer from legacy costs passed on from Thai Airways. Competing against Thai AirAsia and the region’s other leading LCCs in the international market may prove challenging, particularly as Nok's brand is not recognised outside Thailand and the country's international market relies heavily on inbound traffic. But Nok has experience effectively competing against AirAsia in the domestic Thailand market and there is no reason that with the proper marketing and product positioning it can also succeed internationally. A future medium/long-haul operation with widebodies is even a distinct possibility for Nok as the carrier finally breaks out of the domestic market with regional international flights and starts to get more recognition outside Thailand.